I made some free time tonight to get some new items here on the blog. I've got a bunch of items so settle in. First on the list are the Pittsburgh Penguins. Tribune-Review beat writer Rob Rossi says the Pens are ditching the baby blues next season. That's his story and he's sticking to it. Initially published just before Thanksgiving, this rumor is gaining new details — still from Rossi. During an ESPN.com live chat last Thursday, he added that a blue alternate jersey is still in the cards for the Penguins. Rob Rossi: By the way, Pens donning the baby blues tonight. Best uniforms in team history, IMO; they will scrap them for next season, but I'm told the new alternates will have some blue coming back. Joy_Russo: That's a travesty. Those power blues are great. I don't know who this Joy is but she's right. If you'd like to read that chat in its original form, I'm told you have until Thursday before it turns into a giant pumpkin. My thanks to Ryan for the link. And I'm done. Except to say this: Why shed the best jerseys currently in use in the NHL? Is a simple reason too much to ask for if you really have to do it? Regardless, we'll add the Pens to JerseyWatch 2010. Anyway, the Kings are next on the list. Well, not exactly. 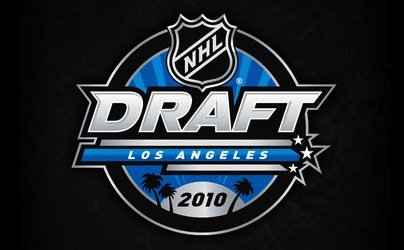 Actually, Los Angeles is next on the list — having recently been announced as the host city for the 2010 NHL Entry Draft. The new palm tree-infused logo is making the rounds. They could do worse. They have done worse. But it's just so not what you'd expect to see on NHL Draft Day. Palm trees and the like. It's what I see on my drive to work every day. All right, knocked another one out. That brings us to Atlanta. Somehow the Thrashers' 10th anniversary logo managed to slip under my radar a few months ago when I posted the Icethetics Season Preview. Embarrassing. 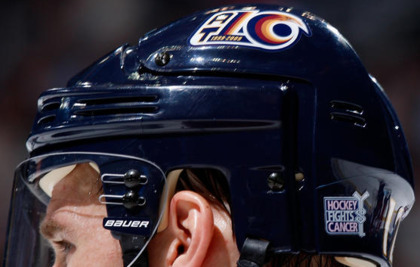 Anyway, a lot of you have been noticing it on the players' helmets. It's wretched, is what it is. This is how you celebrate and symbolize ten NHL seasons? You know me. I rarely have a harsh word to say about a new logo or jersey. But this? Let's break it down. What should we be seeing there? An "ATL" next to a stylized thrasher head? An "AT" (Atlanta Thrashers) next to a 10? A mish-mash of all of that? Whatever it is, it's bad. Go back. Try again. Maybe the reason I overlooked it for the Season Preview was that my brain was unwilling to actually admit to seeing it. Let's move along now. The Ottawa Senators are worth a mention here. Remember that whole ordeal back in August where The 6th Sens blog picked up on the "O" jersey making an appearance on the team's official web site? via Sens ChirpWell another Sens blog has joined the third jersey fray. Icethetics reader Julian writes in to point out that Sens Chirp is adding to new unsubstantiated rumors. See the tiny, unenlargeable image to the right. Why their version of the vintage alternate is red, I don't know. The Senators already wear red at home. However the red helmet is an interesting touch. But let's stick to the black "O" jersey as that is actually aesthetically pleasing. Beyond this image, I have no new information regarding a change to the Senators' third jersey — except to say that they've only had it for two seasons. I think it's a little soon to be dumping it already. Don't make me add the Senators to JerseyWatch 2010. Speaking of ridiculous/wishful thinking, the New York Rangers popped up on the old Icethetics radar this week. A reader sent in this picture claiming it was a leaked third jersey prototype. This is not a Reebok Edge third jersey for the Rangers. It doesn't take an expert to figure out it isn't. Sewing an NHL logo into the collar does not a legitimate Reebok Edge jersey make. And while I'm sure we'd all like to see the Lady Liberty sweater make a comeback, getting my hopes up for no reason is just... mean. Anyway, thought you might like to know. That brings us to the final item of the night. The 2010 Olympic Games are just weeks away and so the IIHF has taken it upon themselves to give us a look at all the new hockey jerseys for the participating nations — all in one place. There's Belarus, China, the Czech Republic, Finland, Germany, Latvia, Norway, Russia, Slovakia, Sweden, Switzerland, and the U.S.A. Wait, I feel like I'm forgetting one. Is Canada fielding a team this year? Someone double check for me. You'll notice that the U.S. is the only country taking advantage of the third jersey cash grab. Because this is America, dammit, and if we're not selling something then the terrorists win. Hey, incidentally, does anyone know how I can go about getting Canadian citizenship? That only sounded like I was kidding.